BBY is committed to supporting Aboriginal-led development and policy reform through building a well-researched and meaningful evidence base. We recognise that one of the most important uses of data and evidence in our work is giving Aboriginal people the power to tell our own story and advocate for change. Through collecting data and evidence at community and government levels, BBY is creating a strong evidence base for BBY Board Directors, Members and key partners to draw upon. This evidence base allows individuals and families to be informed of what is happening in our communities, provides a platform to build regional priorities for the Regional Development Agenda, and supports Aboriginal-led joint decision-making with Governments. This evidence brief is designed to promote and guide discussion about Aboriginal housing and home ownership in Kununurra. It aims to build a common understanding about the current national targeted programs and reforms needed to improve opportunities for people to move into home ownership, and to support the development of a shared agenda. 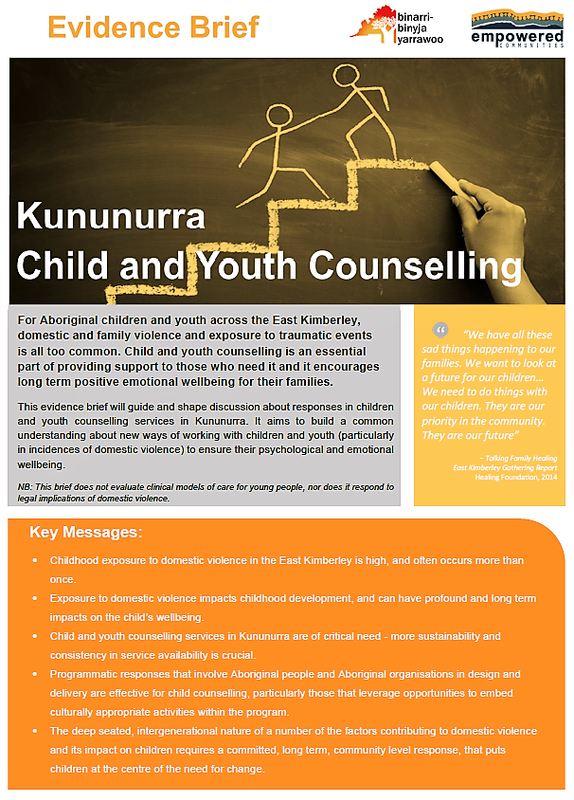 This evidence brief will guide and shape discussion about responses in children and youth counselling services in Kununurra. It aims to build a common understanding about new ways of working with children and youth (particularly in incidences of domestic violence) to ensure their psychological and emotional wellbeing. NB: This brief does not evaluate clinical models of care for young people, nor does it respond to legal implications of domestic violence. This evidence brief will guide and shape discussion about responses to youth crime and youth services in Kununurra and unpacks the complexity of this issue for remote communities in the East Kimberley. It aims to build a common understanding about new ways of working with youth to divert them from the justice system early, and walk a new path. This evidence brief has been written to promote and guide discussion for parents and families, educators, service providers and decision makers, when discussing Aboriginal children and schooling in Halls Creek. It is intended to support development of a common understanding about what is needed to improve education for our children and to support the development of a shared agenda. This evidence brief will guide and shape discussion about employment across Kununurra, Halls Creek and Wyndham. It aims to build a common understanding about reforms needed to improve opportunities for people who are struggling to find and retain meaningful employment. This evidence brief will guide and shape discussion about youth diversion services in the East Kimberley, with a close look at the Halls Creek region, and unpacks the complexity of this issue for remote communities in in the East Kimberley. It aims to build a common understanding about new ways of working with youth to divert them from the justice system early, and walk a new path. This evidence brief has been written to promote and guide discussion for parents and families, educators, service providers and decision makers, when discussing Aboriginal children and schooling in Kununurra. It is intended to support development of a common understanding about what is needed to improve education for our children and to support the development of a shared agenda. This Community Profile has been designed to be a 'quick glance' data snapshot for education and training in Halls Creek. It aims to assist initial discussions on education and training for the Halls Creek community, and to act as a precursor for an evidence brief on education and training in Halls Creek.